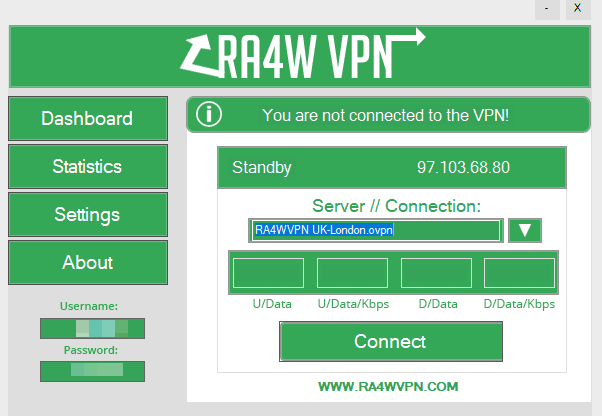 Ra4W VPN was released to the public in September 2013. Since then, it has served over 20,000 clients. This VPN is owned and operated by the U.S.-based RA4W LLC, with access to 33 servers in over 20 countries. Security and anonymity are touted on their site. But that’s the goal of any VPN. If 78 reviews (and counting) have taught us anything, it’s that all VPNs are not created equal. That’s why we set out to conduct this Ra4W VPN review. And yes, we tested each one. Take a look. There’s a lot to love about this VPN. They keep no important log files, which is remarkable for a U.S.-based company. Top-of-the-line encryption and VPN protocols are also offered. Our installation and usability test was simple and effective. Plus, their customer service department was lightning fast and thorough. Here’s a quick recap of everything we liked. 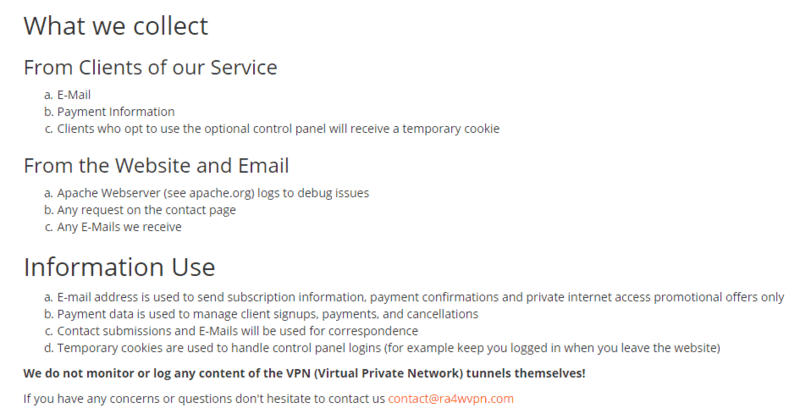 Ra4WVPN makes a bold claim on their main page that they do not keep any logs on their servers. This is a statement echoed by every VPN service. You want anonymity, and if someone is tracking you, then you are not anonymous. When trying to decide if your VPN provider is being truthful, it’s best to roll up your sleeves and dig through the not-so-exciting world of privacy policies. Most companies keep your name, address, and phone number at the very least. But Ra4w VPN is hanging onto nothing besides your email address. Phew. That’s a huge step in the right direction. Encryption and VPN protocols do not get much safer than what Ra4W is using. For starters, they’ve got the industry-leading 256-Bit AES encryption standard, which is what the FBI and CIA use when they want to keep data secure. It is virtually impenetrable, with no known hacks or breaches. On top of that, it uses OpenVPN protocol to tunnel your connection. This is also the leading industry standard, as confirmed by security experts. This is the default pairing we’ve seen from the best VPN companies. So Ra4W is in good VPN provider. Ra4W places zero restrictions on torrenting. You can use it anywhere, anytime, on any server. That’s a huge plus because P2P sharing can often leave your personal data exposed. Locking it down with a VPN is the best way to stay safe while regularly downloading mammoth files. Downloading and installing the Ra4W application was simple and straightforward. There was only one file needed, so I clicked the green button and was off to the races. Installation took under a minute. The program downloaded in a zipped file, so I had to extract it first. It’s worth noting that the username and password you use to sign into the application is not the same as your account username and password that you use on ra4wvpn.com. Instead, your VPN login information is on the website, on your dashboard. I selected a server in London and dove in. Then, I was able to browse the web seamlessly and watched a video on YouTube with zero lags or delays. Ra4W VPN has only one plan which can be entered into for various commitment periods. 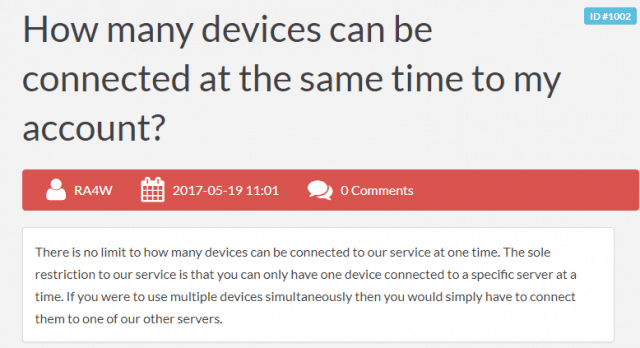 There is no limit to the number of connections you can use, however, each connection on your account has to be using a different server. The server park is around the ‘average’ side, featuring just 33 servers in 20+ countries. Despite that, the unlimited device connections give them an extra edge — compared with most other VPNs that only offer three to five connections at a time. Contact forms make me pause. They’re by far among the slowest customer support options we’ve seen. Whereas email and messaging are usually the easiest. So we get a little anxious when that’s the only option. Our brains immediately start ticking off all the hours it’s going to take for us to get a half-baked response. 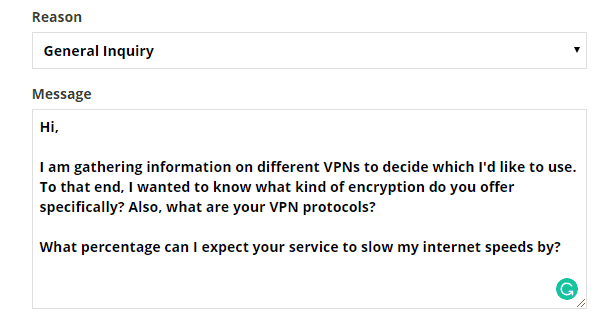 So, after a deep breath, I sent them an email inquiring about their encryption and VPN protocols. Their response came two minutes later. That’s not an exaggeration. It was literally within two minutes. What an impressive response time! Plus, it was an honest and informative answer. I was thrilled with the quality and attentiveness of their customer service department. Ra4W VPN is no different. We detected some leaks through our testing process, and I was disappointed to see no built-in kill switch. No Netflix server compatibility was a bummer. And the device options were also limited. Unfortunately, it can’t save them from a bad starting location. Generally speaking, you do NOT want a VPN company based in the U.S., the UK, Canada, Australia, or New Zealand. 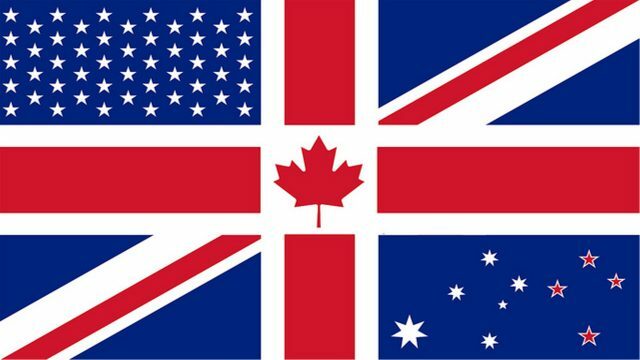 That’s because these are the original member countries of the Five Eyes surveillance alliance. It means these five nations agree to pool and share all of the information they’ve gathered through espionage efforts. Even against their own citizens. Which means as an American company, the U.S. government could demand your information from Ra4W VPN, and they would be forced to comply. What’s more, your info could then be passed along to the UK, Canada, Australia, and New Zealand. Then, go ahead and add the remaining nine members of the expanded 14 Eyes, too, for good measure. Anonymous web browsing loses a lot of its anonymity when 14 federal governments can have their hands in your business. IP leaks are like kryptonite for a VPN. Your VPN client provides a nice green “Success” sign. It looks and feels like you’re safe. Except, you’re anything but. Your internet service provider (ISP) can see everything clear as day. 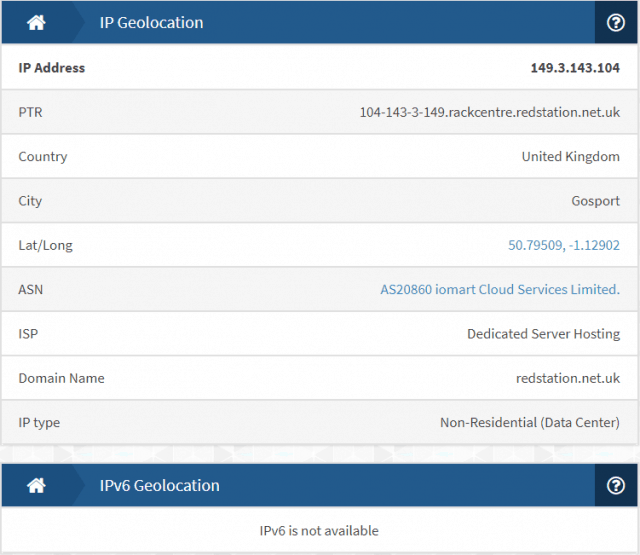 Your IP address is coming through either DNS or WebRTC leaks without you even realizing it. That’s exactly why we test for these. We run every single VPN through a series of six tests to make sure your VPN connection will be legitimate. Each test uses a reputable third-party provider so we can also rule out any bias. Ra4W VPN gave us one red flag, though, failing one out of the six tests. Unfortunately, this wasn’t the only potential issue we found. 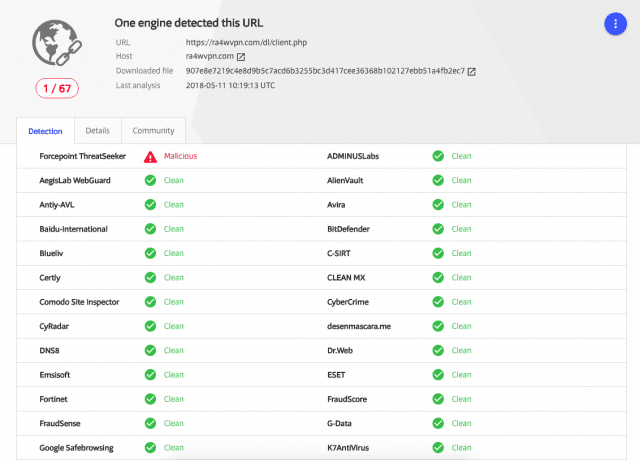 We also ran their installation files through VirusTotal.com to make sure anything you download from them is also legit. Except, we got back a conflicting result which indicates a malicious file could be lying in wait. Not a great performance overall. Especially when security is the number one job of a VPN. Every VPN is going to chip away at some of your performance. It’s the inevitable trade-off for enhanced security. But you shouldn’t have to put up with a VPN that siphons off all of your speed, either. We test the speeds of each VPN in the same exact fashion. We connect to servers in the U.S. and the EU. We record those speeds, compare against our VPN-free connection speeds, and judge accordingly. Unfortunately, our EU test starts poorly. Download speeds plummeted while the upload barely stayed within the acceptable range. Interestingly, our US speed test showed the exact opposite results, with download speeds in an acceptable range and the upload taking a huge hit. This mixed performance only places Ra4W VPN’s at 57th out of 78 speed tests we’ve run. 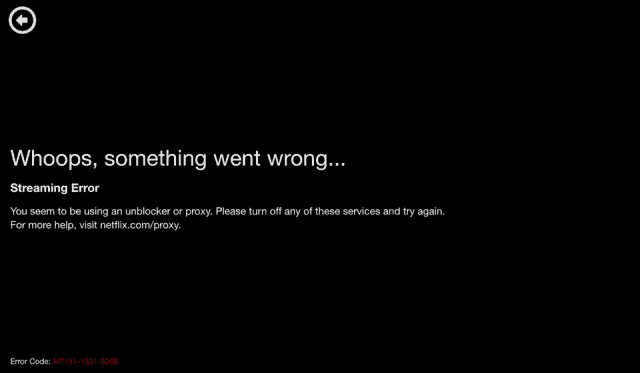 If you’ve tried to use a VPN with Netflix in the last few years, there’s a fairly common sight that is sure to be familiar to you. Netflix’s content varies by region. Strict licensing arrangements control which regions have access to which content choices. Even a few years ago, it was easy to sidestep this pesky issue with a VPN. But today? It’s the opposite. VPN servers almost never work. This used to be simple for VPN users. They just connected to another country’s server and accessed their content. We connected to four of their servers and all four failed to stream Netflix content. This is clearly not news to Ra4W. On the main page of their site, they list a number of websites that work with their service. Netflix is not on that list. Fortunately, there is a select number of high-quality VPNs that still work with Netflix. Right now, Ra4W only offers a Windows app. They can support Mac and Linux operating systems, plus various routers, through manual config files. I was curious as to whether it would work with smart devices, such as a gaming console or Fire TV. I reached out to their very responsive customer support department to ask. I got a response that I wasn’t thrilled with. “Technically” is not a word that I love. Clearly, there are ways to finagle the system to support some smart devices, but it falls outside the list of officially supported products, so I don’t count it. There were no further instructions on what this “manual setup” required, and that information was found nowhere on their website. In addition to this limited compatibility, they also do not offer a built-in kill switch. This handy little feature comes into play when your connection unexpectedly gives out. Normally, your IP address and browsing session is exposed to your ISP. But not with a kill switch. Instead, this brings down your entire session the moment the connection drops. That way, your ISP, government, and other Wifi sniffers can’t get their grubby little hands on your personal data. The lack of a kill switch is especially troubling in this case because of the connection issues we already experienced. Finally, the VPN is not compatible with TOR. 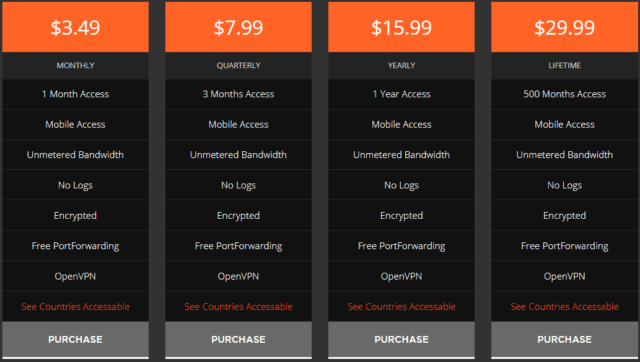 This is one well-priced VPN. There’s only one plan with various commitment levels. Their most expensive price point is $3.49 for one month. That’s insanely cheap for a true month-to-month option that might set you back $10 bucks at another competitor. You can also get the entire thing for a whole year for only $15.99. That’s only $1.33 per month! But the biggest value comes in a lifetime subscription for just $29.99. If you’re going to be paying for the year, you might as well throw in the extra $5 and never have to worry about an expiration. This is one of the only lifetime offers we’ve seen. And definitely the cheapest. Ra4W VPN allows you to pay via credit card (through Stripe), PayPal, and BitCoin. Because their refund policy is about to get lengthy. Essentially, you’ll only get a refund if (1) their service suffers a “major defect” or if (2) there is non-delivery of their service for some reason. Major defects are generally technical issues. While non-delivery applies to you not receiving the proper activation requirements, for example. Otherwise, no refund will be given. The only way you can get a refund is if you spot one of those issues within seven days of signup. You also need to provide “clear evidence” of these issues. So get out your screenshots. So you will NOT be eligible for a refund if you’re merely unsatisfied with the service. You have to prove a problem or a glitch. If you violate their terms during use, you will not get a refund. And if you use one of the virtual currencies to pay, you will not get a refund. Yes, there technically is a refund policy. But not, practically there isn’t. Do We Recommend Ra4W VPN? 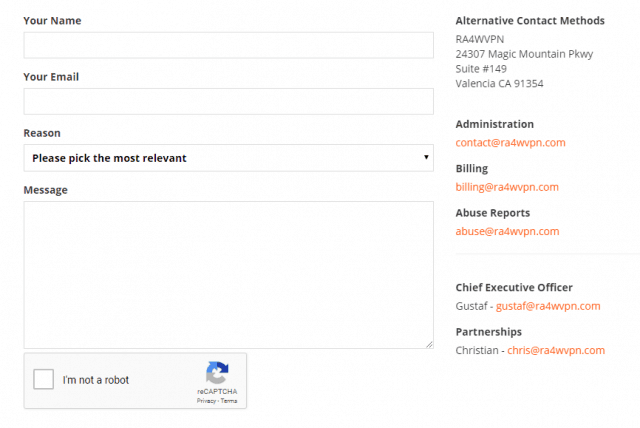 Ra4W VPN ranks at 69 out of 78 options we’ve reviewed. So no, we don’t recommend it. There’s a lot to like about this VPN. A lot to really like, actually. The logging policy and rock-solid encryption made for a decent start. Unlimited torrenting is an awesome perk. It was easy to use, and customer support was actually helpful. But there are still a few things that make me nervous. I’m always hesitant to advocate for VPNs which fall under the 5 Eyes alliance. Their connection gave off leak warnings in addition to a potentially malicious file in their app. Speeds were pretty slow across the board. And the extremely limited device support makes using Ra4W VPN a pain outside of Windows devices. Windows10 was easy enough, I’ve used their app and OpenVPN app. Both were easy enough to configure. Phone is a little more tricky, have to email yourself the correct config files and use OpenVPN. Price was a huge selling point for me, 20 bucks for lifetime use? Can't beat it, speed is decent for web browsing, gaming expect to see double your current ping. 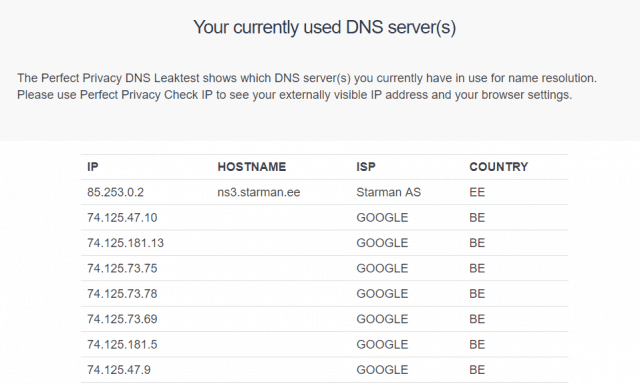 DNS leaks are common unfortunately when running my own test, but I guess you get what you pay for when it comes to VPN's. Absolutely agree: Do Not Recommend! Friends, On top of everything said in this great review, I personally experienced several instances of Windows  applications turning off/crashing on it's own within 2 weeks I was experimenting with Ra4W VPN. Of course, this instability combined with lack of Kill Switch meaning your real IP address is fully exposed, same as the protocols you are using . No matter what's the price, no matter any other advantage, this is it: DON'T USE IT EVEN IF IT WAS FREE. Ok, the setup needs an advanced user to understand their manual, the software they have is terrible, so use open vpn software and then follow the directions to configure that. Too many holes in the dns and too many bad reviews. Their service is fast, the prices are cheap and once it's configured it works, kinda.